→Shea Butter For Hair: How Good Is It Really? There has been increasing trend over the past decade for people to use natural oils on their hair to strengthen and thicken it, while also addressing significant underlying skin and scalp issues. Alongside jojoba oil (read more here), coconut oil (and here), there has recently been a trend towards recommending shea butter for hair and scalp conditioning, with many people reporting a transformation in the health of their hair skin, in some cases reporting regrowth of hair. But with little scientific research into the benefits of shea butter on the hair and skin, alongside dissenting voices claiming it dries out the skin and hair, what's the truth about using shea butter on your hair? Is it another natural miracle, or is it more about natural health and beauty bloggers picking up on an unproven idea and twisting the facts slightly, the result of this ongoing “Chinese whisper” being to inadvertently creating a new truth? Should You Use Shea Butter For Hair? How Could Shea Butter Benefit Your Hair? Can You Use Shea Butter For Hair Growth? Does Shea Butter Have Any Side Effects? So Should I Try Shea Butter To Improve Hair Health? What Shea Butter Should You Buy? Shea butter is expensive because it is extracted manually from the dried nuts of the Vitellaria tree, which is native to western Africa. It is ground into a paste from the fatty seeds, which is then usually mixed with water to separate the butter into a curd. The curd is then melted and filtered to purify it, producing a thick and rich butter. You can buy the butter bleached so that the sometimes strong smell doesn't interfere with your beauty routine, but this is not the natural butter and should not be considered if you want the full benefits of it for skin and hair use. It's the high fatty acid content, over 90%, which makes shea butter interesting. These fatty acids are what are known as “short-chain" fatty acids which are highly beneficial human skin, as well as being very absorbent and in tune with it. Oleic acid is mostly found in olive oil. Both the Mediterranean people and the people of Western Africa have used olive oil and shea butter respectively to derive the same skin benefits. Linoleic acid is also an Omega 6 enriched fatty acid which has been linked to positive skin conditioning properties. So generally, the properties of shea butter are conducive to skin health. This is where the jury is still in deliberation. Although shea butter has a lot in common with things like coconut oil, it does not have the same depth in nutrients. It does however contain a rich set of natural fatty acids in oil form, that sink into the skin and hair, which can seal and moisturize both of these. There is no doubting it can benefit the skin in the short term, and can moisturize and protect the hair, but beyond that it becomes problematic. There are very few studies, literally less than 20, directly looking at the benefits of using shea butter on the hair and skin published. Those that have been published are also mostly indirect, not direct studies on sample groups looking at skin or hair improvement specifically. So most of the evidence is anecdotal and is either historic or passed on through Internet information. This is why it is difficult to determine how good it is for your skin and hair. The contents of shea butter, in common with coconut oil, do potentially have anti-inflammatory and antioxidant properties, which have been more proven in coconut oil studies. The anti-inflammatory properties are mostly links to this butter containing cinnamic acid, which has been linked to reducing inflammation in the skin. Which means that the commonality between several types of oil points to the possibility of deriving the same benefits from using shea butter on the hair. There is no evidence that shea butter directly encourages hair growth. However, this is in common with most other natural oils that are recommended for that purpose. 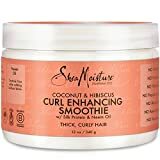 Improving the condition of the hair involves moisturizing, nourishing and sealing the hair shaft to encourage a better look and stronger growth. Undoubtedly shea butter achieves these goals. In terms of the scalp, the anti-inflammatory properties can potentially have strong benefits. Just like coconut oil and jojoba oil, shea butter is reputed through the fatty acids it contains to have natural anti-inflammatory properties. The root cause, excuse the joke, of most hair loss is the hair follicles in poor condition. This usually happens over a long period of time, where skin gets cracked, infected and damaged, leading to the follicles over time inflaming and gradually closing up. By addressing this process, shea butter can potentially keep the follicles in better shape, keeping them more open and better supplied with nutrients, thereby keeping hair growing when it might otherwise have died. Other conditions such as eczema and psoriasis on the scalp can also contribute towards damaged hair follicles. Simply by working as an emollient, shea butter can also potentially counter the drying out and inflaming of hair follicles due to these conditions as well. Many people who are trying to decide which oil to use often look at a straight choice between shea butter and mango butter. Both have been in use as skin conditioning substances for millennia, with Cleopatra reputed to have used both to keep her skin and hair in good condition. Both mango butter and shea butter contain high quantities of fatty acids, alongside properties which can reputedly reduce inflammation and bacterial infection. Both also have high quantities of vitamins and other nutrients, which can be good for the skin and hair. In terms of asking which is best, it's not a simple choice to make unfortunately. Mango butter is harder to use because it is a harder when cold and takes more time to warm up and use. It also does not contain as much of the active ingredient which can reduce inflammation as shea butter, which could make it less effective for that purpose. However, mango butter does contain natural UV properties which could protect the skin of your scalp from sun damage over time could lead to the follicles closing up. Shea butter does not have any significant side-effects in terms of affecting health or skin condition. Generally it is easy to use, pleasant on the skin and hair and does not have any unpleasant side-effects in most cases. One slight complaint is that unrefined shea butter has a strong aroma which some people find overpowering. That is why bleached shea butter is sometimes used in beauty products. However, bleaching can remove some of the key nutrients and is not recommended. Another potential side effect that has been reported particularly by people with Afro-Caribbean hair, basically people with very thick and wiry hair, is build up leading to dryness. Some bloggers in this community report that excessive use can cause a buildup of shea butter on the scalp is not washed away by shampoo. This is a problem is reported as worse if natural organic shampoo is used because it doesn't contain detergents to get rid of the oil. The build up can potentially stop other nutrients from getting to the follicles and put them in a worse condition, however this is not proven and is only reported anecdotally. A great place to buy shea butter is a general site like Amazon which allows user reviews and has plenty of customers. Because of these characteristics you can look at what other people say about a particular brand or type and make more informed choice. On arrival, shea butter should be in a soft but also solid form. You should be able to scoop out a small amount onto the palm of your hand, rub the palms together until it is warm and turns into a rich oil, and then simply apply it to the skin and hair by pushing the fingertips and palms gently across and through. Ultimately shea butter, like coconut oil, jojoba oil and mango butter, could benefit your skin and hair. It does have properties which are linked to hair and skin health, but excessive use or reliance on it could saturate the hair and scalp, potentially lowering the benefits you could derive from its application.